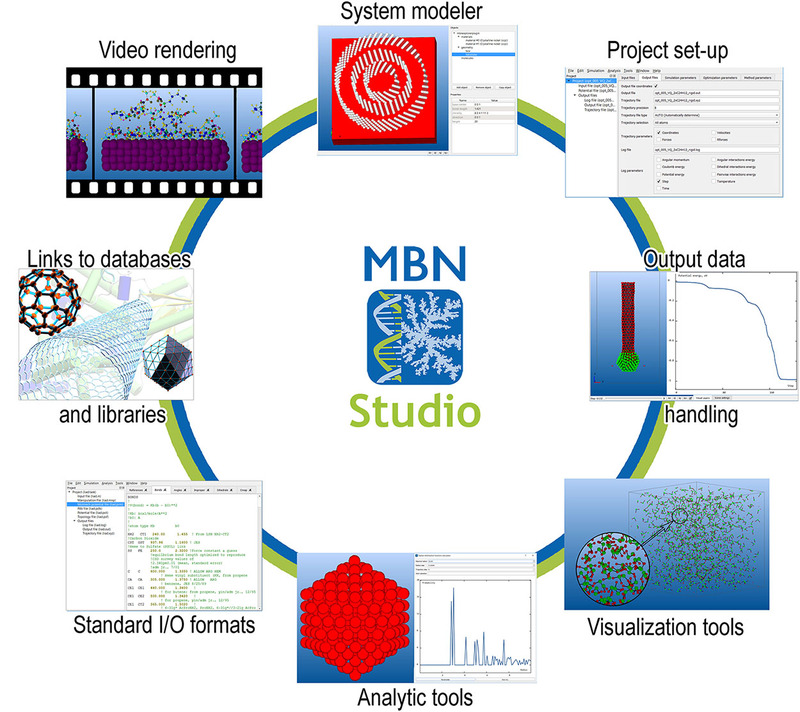 MBN Studio is a graphical user interface for MBN Explorer that has been developed to facilitate setting up and starting MBN Explorer calculations, monitoring their progress and examining the calculation results. The interface can be utilized for any type of calculations that are supported by MBN Explorer, i.e. single-point energy calculations, structure optimization, molecular dynamics (non-relativisic, relativistic, Euler), and kinetic Monte Carlo simulations. Apart from that MBN Studio has a number of built-in tools allowing the calculation and analysis of specific characteristics that are determined by the output of MD simulations. Examples include diffusion coefficients of various molecular species, heat capacities and melting temperatures, radial distribution function, etc. A special modeling plug-in allows one to construct a large variety of molecular systems quickly and efficiently. By means of this plug-in one can easily construct molecular systems of different geometries (e.g. spherical or ellipsoidal nanoparticles, cubic crystalline samples, etc.) with various atomic composition. MBN Studio is available for all major operating systems: Windows, Linux, macOS. 3) After the submission of the purchase order, you will receive per email an invoice for the chosen version of the software issued by the MBN Research Center. 4) Perform bank transfer of the due bill. 5) Upon the receipt of the payment by the MBN Research Center, you will receive per email an initialization key and a link to the web page with the purchased version of the software, User's Guide, Tutorial Book, Tutorial examples and the library of examples.